The surrounding area was originally occupied by the Ma people - especially in the area that is now Cat Loc (in the 1960s eastern Nam Cat Tien was described as "inhabité - uninhabited") and Stieng people in western Dong Nai Province. After the formation of the Park, many of these people were re-settled in Talai village, to the south-west of Nam Cat Tien. Cát Tiên National Park (CTNP) was protected initially in 1978 as two sectors, Nam Cat Tien and Tay Cat Tien. Another sector, Cat Loc, was gazetted as a rhinoceros reserve in 1992 upon the discovery of a population of the Vietnamese Javan rhinoceros, an occasion that brought the park into the world's eye. The three areas were combined to form one park in 1998. Nam Cat Tien is contiguous with Vĩnh Cửu nature reserve thus providing an enlarged area for species to breed. The forest is now protected by the Kiểm lâm (VN Forest Rangers) with responsibilities for managing poaching, fire control, and other issues. Parts of the park area suffered historically during the Vietnam War when it was extensively sprayed with defoliant herbicides. However, substantial further damage was done by logging up until the 1990s. To this day these areas have extensive bamboo and grassland cover and trees have not yet grown back. The Cát Tiên archaeological site is located just outside the park boundary on the northern bank of the Dong Nai river (between Cat Loc and Nam Cat Tien, facing in to the latter). Excavations carried out between 1994 and 2003 revealed a group of temples, belonging to a previously unknown Hindu civilization which probably inhabited the area between the 4th century and 9th centuries AD (possibly later). A large number of a number of gold, bronze, ceramic, coloured stone, and glass artefacts, are currently displayed in the Da Lat museum. Fabaceae: Afzelia xylocarpa (Caesalpinoidea) and rosewoods (Papilionoideae): including the endemic Dalbergia mammosa. Dipterocarpaceae: notably Dipterocarpus alatus, which occurs naturally, but with a good survival rate, it is widely used for replanting; Hopea odorata is also used for replanting. The abundance L. calyculata is discussed by Blanc et al. especially as an indicator of secondary forest. "It appears to be a very good competitive species able to regenerate on denuded areas: along roads and on land abandoned after cultivation. Human disturbances have mostly affected Dipterocarpaceae for resin and Fabaceae for their wood." The low canopy and under-story zones contains species such as the endemic Cycas inermis; a number of palms are common, including Caryota mitis, Licuala and Pinanga spp., together with a wide range of fruit species (important food for animals) such as figs (e.g. Ficus racemosa) and wild bananas (Musa acuminata). 3. Secondary forest with abundant bamboo species: this due to human activity, the forest having been degraded by logging, forest fires and in some areas war-time defoliants, which have caused the forest canopy to be replaced with bamboos. Common trees include Lagerstroemia calyculata, Mesua sp. and Xylia xylocarpa, with bamboo species present. 4. Bamboo forest (some 40% of the Park area) may also have been affected by human activity, including areas where forest was previously cleared for subsistence agriculture creating favourable conditions for bamboos; species include: Bambusa balcooa, B. procera, and Gigantochloa spp. In the rainy season, Dong Nai river water floods into an area of 2,500 ha area of northern Nam Cat Tien, along the Da Kluo which is a reverse flow stream (like Tonlé Sap) replenishing the lakes: Bau Sau (crocodile lake), Bau Chim, Bau Co and the surrounding grasslands. In the flat eastern half of Nam Cat Tien especially, there are a number of swamps (see above) surrounding isolated, poorly-drained small open areas – typically 3-10 ha - that might best be described as wet meadows - that are often surrounded with swamp forest and may also contain vernal pools. As in most seasonal tropical forests the Park has an abundance of epiphytes (such as ferns, orchids and 'ant plants' such as Myrmecodia). Lianas are abundant and include: Ancistrocladus tectorius, box beans: Entada spp., 'monkey ladders': Lasiobema scandens and Rattans: especially Calamus spp. in wet areas. In flat lowland areas and especially along streams, areas of freshwater swamp forest notable tree species often include: Ficus benjamina, Livistona saribus, Crateva, Syzygium and Horsfieldia spp. Naturally occurring patches of Bambusa blumeana (tre gai or tre la ngà) are also abundant in riparian areas and flooding forest. Other plants include Schumannianthus dichotomus ("cool mat") which occurs in muddy areas along streams. Numerous endemic species, having their type locality at CTNP, have been described by Vietnamese and international scientists: including those at the Vietnam-Russia Tropical Centre. At least 14 species of organisms have the name "catienensis" or similar, including two palms (Licuala illustrated here), the bracket fungus Tomophagus cattienensis, two reptiles and 4 insects to date. Between the Park headquarters and Ta Lai village there are substantial replanting areas, including a 200 ha area supported by European Community between 1996-98.
fruit bats Pteropodidae 4 spp. false vampire bats Megadermatidae 2 spp. horseshoe bats Rhinolophidae 5 spp. leaf-nosed bats Hipposideridae 3 spp. evening bats Vespertilionidae 12 spp. mice & rats Muridae 14 spp. The park fauna included the Javan rhinoceros, and was one of only two populations in the world, until poachers shot and killed the last rhino in Cát Loc in 2010. There are also records of banteng and kouprey, but the latter may now be globally extinct, and wild Asian water buffalo no longer occur in Cat Tien. Some accounts also list Indochinese tigers, leopards, clouded leopards and dholes; however, a recent series of surveys did not confirm this. Oligodon cattienensis the Cat Tien kukri snake. cat snakes: Boiga (4) spp. The most developed insect lists currently cover ants, butterflies, dragonflies, mosquitoes and termites; of the latter, Macrotermes spp. have an important ecological role, with large colony mounds very commonly encountered in the forest. In 2007, the velvet-worm Eoperipatus totoro was discovered in the Crocodile Lake area by scientists of the Vietnam-Russia Tropical Centre. 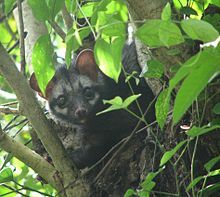 Cat Tien comprises an important reserve in Vietnam, both for the habitat it protects and the number of species it contains. Although the population of the Javan rhinoceros went into extinction, it is still home to 40 IUCN Red List species, and protects around 30% of Vietnam's species. The park is, however, threatened by encroachment from local communities, illegal logging and poaching. In addition, the park is too small for the larger species found inside it. This has led to either their local extinction or conflict with local people as these animals move beyond the confines of the park. This problem is particularly intense for the park's elephant population, which is prone to wandering and is considered too small to be self sustainable. Since the early 1990s, partly as a result of the discovery of rhinos in the park, international donors and the Vietnamese government began to invest more money in protecting the park and managing the resources of local State Forest Enterprises, nearby and adjoining forests (including Vinh Cuu Nature Reserve), in co-ordination with the park as a whole. There have been moves to combine a management plan that allows for both traditional park management and some limited resource utilisation by local people, which include the Stieng, Chau Ma (now concentrated in Ta Lai) and Cho'ro minorities. In 2008 the Forestry Protection Department collaborating with the Endangered Asian Species Trust (UK), Monkey World Ape Rescue(UK) and Pingtung Wildlife Rescue Centre (Taiwan) founded the Dao Tien Endangered Primate Species Centre. The centre focusses on the rescue, rehabilitation and release of the four endangered primates found in Cat Tien (golden-cheeked gibbon, black-shanked douc, pygmy loris and silvered langur), developing Government guidelines for release of primates. The centre conducts informative daily educational tours explaining the centre's work, with a chance to see young rehabilitated gibbons in the trees. ^ "Bau Sau Wetlands and Seasonal Floodplain". Ramsar Sites Information Service. Retrieved 25 April 2018. ^ "Cat Tien National Park - master". www.namcattien.org. Retrieved 2016-07-25. ^ Boulbet J (1967) Pays des Maa’, Domaine des Génies: Nggar Maa’, Nggar Yaang. Publ. École Français d’Extrême Orient, Paris. Vol.LXII, 143 pp + An. ^ "Cat Tien Archaegological Site". ^ a b "Cat Tien National Park". UNESCO. 2006. Retrieved 31 March 2017. ^ "Ecology - Forest Floor Lodge". Retrieved 2016-07-25. ^ Project no. VNM/B7-5041/I/95/19: see Millet ibid. ^ "Cat Tien National Park - mammals". www.namcattien.org. Retrieved July 10, 2016. ^ Nguyen, M., H., (2009). The status of Vulnerable gaur Bos gaurus and endangered banteng Bos javanicus in Ea So Nature Reserve and Yok Don and Cat Tien National Parks, Vietnam. Oryx 43 (1), 129-135. Wildlife rescue centre based in HCMC - helps fund moon bear project in Cat Tien National Park. Thanh, Dinh; Kimihiko, Hyakumura; Kazuo, Ogata (14 March 2012). "Livelihoods and Local Ecological Knowledge in Cat Tien Biosphere Reserve, Vietnam: Opportunities and Challenges for Biodiversity Conservation". InTech. doi:10.5772/33021. Retrieved July 10, 2016.